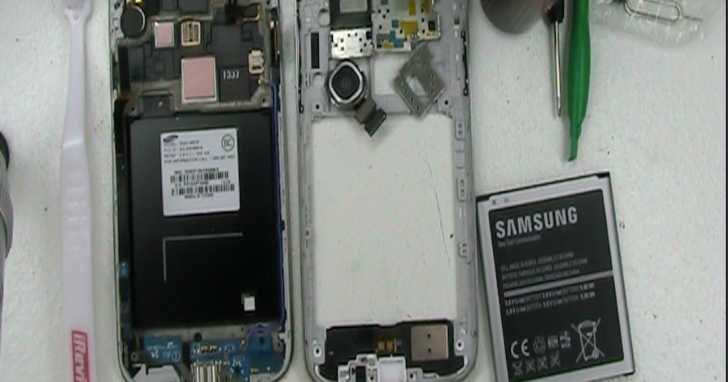 There are 3 water damage sensors located on the Samsung Galaxy S4. 2 Are shown in the first picture. The one on the left with the "X"'s is only visible from inside. While the one to the right that is red on the backside will be visible through a small hole in the back frame. 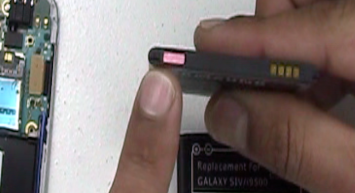 Remove the back from the Galaxy S4 by using a pry tool or finger nail in the indention on the top left side. Take out your SIM card and memory card. Take the battery out. Take out the 9 screws around the perimeter of the phone with the phillips screw driver. Use pry tool in between the screen and the bottom frame. Start by the charging port and then once you have it slide around gently to loosen the frame from the screen. You should hear the clips that hold the back frame on unsnap as you go around. Use flat screw driver to pop up the final clip that is at middle top of the battery compartment. Unsnap all the flex cable connectors with your flat screw driver. Be very gentle and do not touch or leverage on any of the other chips on the board. Use the phillips screwdriver to undo the screw in the top right. Lift the logic board out of the phone from the bottom. You should have no resistance when doing this. Disconnect the camera from the back of the logic board with your pry tool. Use the flat screw driver to pry the corner of the board as shown in the picture. You can pry from that corner because there are no chips that you can damage. Remove the other cover in the same way by starting from the corner and gently prying upwards. 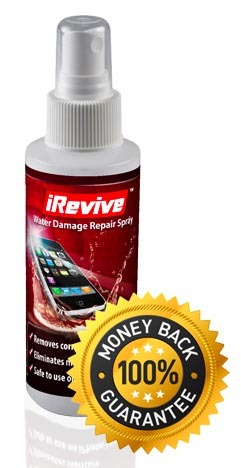 Spray iRevive onto the board and then scrub gently with the brush. This removes all of the corrosion on the board and will Its very important to clean on all sides of all the chips on the board. Repeat this process on both sides of the board. 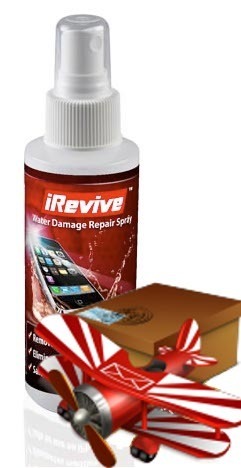 Set the logic board aside to dry then spray irevive inside the frame of the phone and clean the bottom charging port. Corrosion tends to form inside the flex cable connectors so be sure to give each one of them a few brushes. Put the logic board back in the galaxy S4. Snap down all of the flex cables, don't forget the antenna connector in the bottom right corner of the board. Replace the phillips screw in the top right. Snap the back plastic frame back onto the phone by fitting the top edge in first then snapping the rest of it down. Work your way around the outer edge of the phone to snap the frame back into place all the way around. 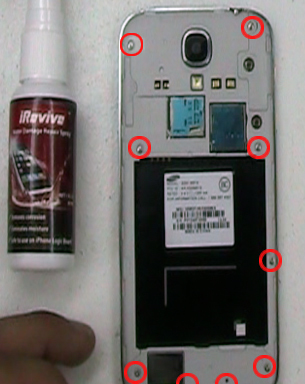 Once the frame is snapped down securely, replace the 9 phillips screws around the perimeter of the phone. Replace the battery, your SIM and memory chips then power the phone on!